Leslie Thompson’s works delight the eye, both for the spontaneity of some pieces and the controlled precision of others. A black and white checkered pattern mimics water overflowing a jug. The turquoise frog, a Zuni fetish, seems ready to leap from the top of a pot covered in an array of triangles. The precise geometric patterns of Thompson’s pots create illusions of motion for the observer. 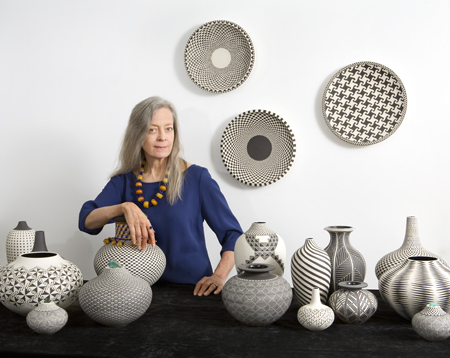 A self-described “American potter,” her work is a tribute to the Pueblo cultures of the American Southwest, a place to which she feels strongly connected. However, her patterns are also inspired by influences as diverse as op-art, M.C. Escher, and traditional women’s crafts such as quilting. Why black and white? These two non-colors provide the “best vibration” for creating the optical illusions that are so prevalent in her work. The introduction of color to her creations in the form of Masai-styled bead collars has resulted in a striking fusion of cultures and media. Thompson’s work has been shown in the Smithsonian’s National Museum of Women in the Arts , the Sausalito Arts Festival and other prestigious venues. Leslie Thompson’s documentation took place in 2007 and was sponsored by Sandra and Jordan Laby, Ojai Studio Artists and Dr. Richard Gould. The FOTM Archive contains extensive information about this artist.